The J. League’s return to a single-league format will make this season’s championship more of a marathon than a sprint, but four teams have already got off to flying starts after their opening two games. Yokohama F. Marinos, FC Tokyo, Vissel Kobe and Vegalta Sendai are the only sides in the 18-team division with perfect records after two rounds, with Marinos topping the embryonic table on goal difference. Yokohama’s preparations for the new season looked anything but ideal when iconic playmaker Shunsuke Nakamura left for Jubilo Iwata and the club brought in a mixed bag of replacements. 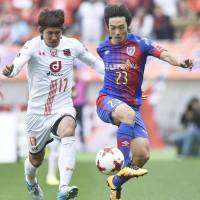 A 3-2 opening win over Urawa Reds followed by a clinical 3-0 rout of Consadole Sapporo last weekend has proved Marinos’ doubters wrong so far, however, with new strikers David Babunski and Hugo Vieira both scoring in both games. Tokyo’s new signings are much more familiar with the J. League, but nothing is ever guaranteed and manager Yoshiyuki Shinoda will be relieved to see Yoshito Okubo, Kensuke Nagai, Yojiro Takahagi, Kosuke Ota and Akihiro Hayashi all settling in nicely. Tokyo has yet to concede a goal after beating champions Kashima Antlers 1-0 and Omiya Ardija 2-0, and last week’s signing of Nigerian striker Peter Utaka — last season’s joint-top scorer with Sanfrecce Hiroshima — gives Shinoda even more options up front. How Vissel would love to be blessed with such attacking riches, after losing striker Leandro to injury for six months on the opening day and German World Cup-winner Lukas Podolski not set to join the club until the summer. Vissel have proved their resilience with victories over Shimizu S-Pulse and Albirex Niigata, however, and if they can keep racking up the points before Podolski arrives, who knows where it could take them? Few people will be tipping Vegalta for the title, meanwhile, but the Tohoku side is unlikely to care after successive 1-0 victories over Consadole and Jubilo lifted it above more illustrious names in the table. It is true that no prizes are handed out until December, but there is no harming in making an early start. Wardrobe malfunction: Kashima Antlers striker Pedro Junior was faced with a sartorial challenge when club staff forgot to pack his uniform for Saturday’s away game against Ventforet Kofu, but a piece of hastily improvised tailoring saved the day. The Brazilian, who wears No. 7 for Antlers, borrowed a uniform from teammate Bueno, who wears No. 17 but was not included in the matchday squad, and covered up the first digit with white tape to match the color of the shirt. Once the match commissioner had given his approval, Pedro Junior was good to go. His original uniform eventually turned up before the start of the second half, and although he failed to get his name on the scoresheet, Antlers won the match 1-0. Beating pulse: Shimizu S-Pulse claimed promotion by winning their final nine games in J2 last season, but a 1-0 defeat by Vissel Kobe on the opening day of the new campaign gave the Shizuoka side a reality check. 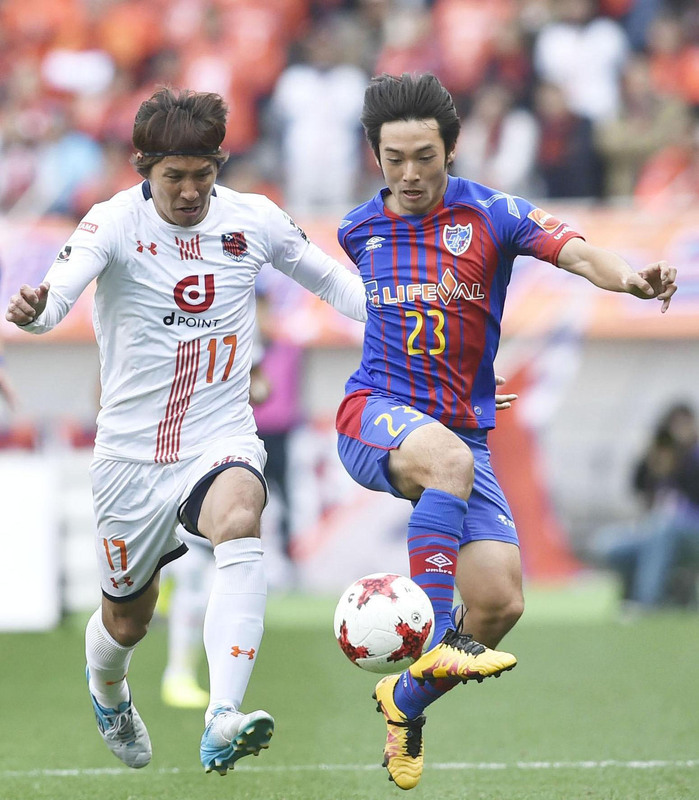 S-Pulse followed that up with a 1-0 away win over Sanfrecce Hiroshima last Saturday, however, and goalscorer Chong Tese believes he and his teammates can take confidence that they can compete in the top flight. “We weren’t uptight like we were in the opening game,” said Chong, who scored 26 goals in J2 last season. “We created a lot of chances, although we had trouble finishing them and it took a second-half penalty to get the win. Kashima Antlers goalkeeper Kwoun Sun-tae recalls his injury-time penalty save from Ventforet Kofu striker Wilson after his team’s 1-0 win on Saturday.